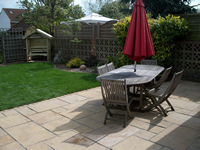 Garden Landscaping and Design Project Portfolio - RW Landscapes - Innovative Garden and Landscaping Solutions - Hitchin, Hertfordshire. A rear of house garden patio making use of the sun drenched garden through from Spring into Autumn. 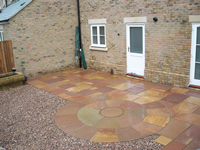 This shaped stone patio was designed to look and feel like an outdoor house extension. 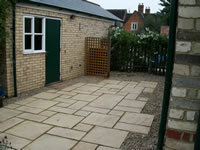 Enhancing a tired back garden and making the rear of the garden more accessible and inviting. Creating focus, organisation and order. Visually creating light and space by changing adding and re-arranging elements to suit. 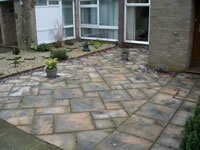 An interesting styled patio enhancing a small back garden / yard area. Various shaped stones giving the main area an interesting visual feature with an integrated garden bed for plants and flowers running along the outer perimeter of the back wall. A full back garden patio with water feature. A tasteful set of natural sandstone quality slabs with water feature and raised perimeter plant and flower bed edged with railway sleepers. 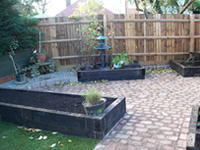 An ideal full feature low maintenance practical back garden. 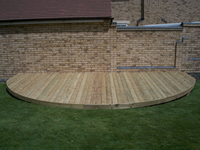 A decking platform for barbeques, patio and a performance area was asked for on the perimeter of a larger back garden. 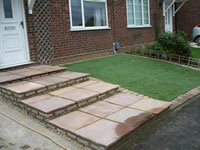 The slope for drainage enabled a raised platform to be built to keep the decking level. 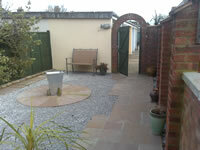 Renovating, updating sympathetically and in keeping with the house and all the outbuildings, landscaping and making this courtyard feel part of the house and garden area and making it fully accessible for garden equipment and bicycles. For a customer who required a low maintenance front garden area, but retaining some plants on a decorative rustic landscaped stone area. From start to finish, design drawing and preparation work, removal and recycling or the reusing of all old materials including stone, plants and grass. 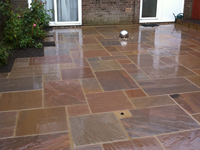 All ground preparation and levelling with landscaping using natural shaped and cut stone and shale. With plants and furniture to fit the finished article. 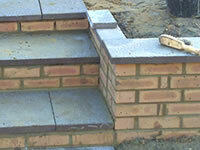 Full planning for easy wheelchair access all around the perimeter of the house and garden. Laying of rustic stones for the driveway with heavy duty stone for the side and rear garden areas. 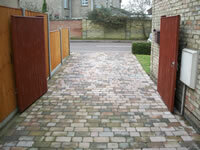 the further requirement was for Installation of fencing and access lighting. 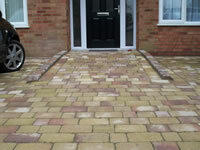 A compact garden and entrance given a clean yet traditional feel using stone and strong wearing coloured slabs. A re-turfing with quality grass for a shaded lawn area completed the new comfortable and clean feel. Part of the project was the designing and building of a styled wall not only to match the rest of the garden but to give a small garden character on different levels. 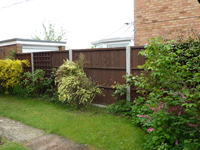 Removing and replacing foundation work and building a customised width fence between houses in a residential street. Planning for water drainage was paramount in this design. Working with the existing drainage flow and underlaying and directing the stones towards the best drainage area. Gate and fencing construction and driveway clearance was integral to the design. 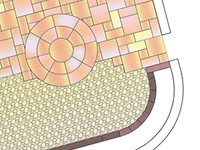 A number of garden landscape design drawings giving an outline of how a potential garden project might look in a clean simplistic and visual way using Computer Aided Design (CAD)..